Baroness Kessler: "My latest work—"The Devil: History and Myth"—a kind of biography. It will be published next year." Dean Corso: "Why the devil?" MPAA Rating: R for for some violence and sexuality. 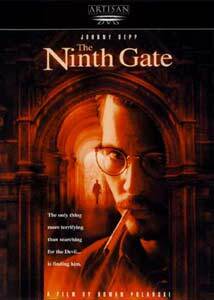 For about an hour and a half of its over two hour running time, The Ninth Gate works. It is a tightly told and nicely paced film noir with great thriller moments thrown in. But then something happens that brings the film to a dead halt. I can't exactly pinpoint the time when the film goes from an above average horror movie to a B movie with Hollywood stars, but it does happen. This is a film that should have sparked conversations after it was over but sadly the only word to come out of my mouth when the credits rolled was, "What?" Johnny Depp stars as Dean Corso, a rare book dealer whose tactics are known to be somewhat shady. One day, a client named Boris Balkan (Langella) makes Corso an offer that's too promising to refuse. Balkan has just come into possession of one of three copies of The Ninth Gate, a 17th century occult novel co-written by Lucifer himself. Balkan hires Corso to make a trip to Europe and authenticate his novel against the others. As the film goes on Corso falls into a dangerous world where people with ties to the novel start dropping like flies. He meets Liana Telfer (Olin), the mysterious widow of the previous owner of Balkin's copy. Corso also receives some help from a mysterious woman whom we learn almost nothing about throughout the film. One has to wonder just what this character's point is, other than to pop up at exactly the same time that Corso is dangerously close to death. If any of that sounds confusing, don't worry it isn't: it is actually very easy to piece together as the film goes on. The only question I had is: What exactly transpires during the last 30 minutes? I actually went back and skipped through the final scenes to make sure I had not fallen asleep and missed anything. None of this seems to be the fault of the actors, but rests with the writers and the director. I think there should be a law in Hollywood that states that having more than two writers on a project is a bad thing. The strangest thing about the film actually has nothing to do with the plot—it has more to do with the fairly strong pedigree in front of and behind the camera. Director Roman Polanski has done great work in the past, but over the last decade it seems as though his films have been both commercial and critical disasters. Where is the brilliance of Chinatown or the haunting mood of Rosemary's Baby? Polanski is, unfortunately, known more in the 90's for off-screen matters than for his film career. The screenplay by the three scribes feels like three different stories; it seems as if each writer handled a different section as the overall sense is extremely uneven. The cinematography is downright beautiful as Dharius Khondji makes yet another bad film look great. It is actually a skill that he is getting quite good at after films like this one and The Beach. The actors assembled run the gamut from great to just plain awful. Depp creates a role that is neither the best of his career nor the worst. He's a personal favorite of mine and I almost always enjoy seeing his work. I know that he will rebound from this film. Others that won't are Langella and Olin. Both are on the downslides of a career that was once somewhat promising. but here they seem to be playing here for their paychecks. Another under performer is Emmanuelle Seigner as the "mysterious woman." I wondered what would lead Polanski to cast her when it is clear that, while she is beautiful, she can't act to save her life. All questions were quickly answered while I was doing research and found out that she is in fact his wife. Nepotism rears its ugly head yet again. Presented in an anamorphically enhanced 2.35:1 aspect ratio, The Ninth Gate doesn't look as good as other Artisan titles that have come before it. Both The Limey and Stir of Echoes are perfect examples of what Artisan can do with a transfer—and it is that level of perfection that is strangely lacking from this disc. With a story about evil and satanic circles one would not expect this to be a vibrantly-colored film—and it isn't. Black levels are done well enough and the sharpness is not a problem here. Detail and clarity are fine as are the colors and are well presented. Fleshtones look to be spot on although I did notice a few exceptions with some of the faces a bit on the red side. The main problem with the transfer is that it just looks dirty. This may have been the director's intent, but I find that hard to believe because other scenes look clean as can be. So, while not perfect, this is still a very nice transfer. If the video transfer revealed a few flaws, the audio transfer blatantly points them out. For this type of film I expected to hear a very good 5.1 Dolby Digital soundtrack, but what is presented is nothing more than a primarily 3-channel track. I actually had to stop the film and check if my surrounds were really on: I have never had to do this before. Dialogue is easy to understand and the score flows evenly across the front soundstage. The .1 LFE channel is powerful and really does its job when needed. This mix would have received a much higher grade had the surrounds been used more aggressively. Extras Review: As opposed to having a bunch of useless extras like most flavor-of-the-minute horror films, this special edition DVD does a very nice job with the special features. The most important thing on the disc is the audio commentary by director Polanski that is both informative and fun. I wasn't exactly looking forward to listening to the track but within about 20 minutes of hearing him talk, I was hooked. The downside to the track is that he doesn't go into detail about the ending of the film. I for one would have loved to have heard his thoughts on the final act because then I might have had some idea of what was going on. Three theatrical trailers are offered on the disc and they are a nice inclusion. Each is mixed in 5.1 and sound marginally better than the film itself. The teaser titled "Denial" is a personal favorite as it contains the song of the same name by a favorite band of mine, Sevendust. On the same note there are also two easter eggs on the disc that when found reveal two tv spots for the film. A short 2 minute featurette is offered and it might be the first spot to feature more from the trailer than interviews. A collection of storyboards is handled well by including the text of the scenes shown. An isolated score is offered in Dolby 2.0 and plays over the film. There are gaps when the film has no music and it gets distracting from time to time. Extensive cast and crew bios are available, as are samples of the drawings in the book. After talking to co-workers I found that I wasn't the only person who disliked this film: others had the exact same reaction and problems that I'd had with it. So with that in mind I leave it to you to make your own choice. I would at least suggest it does offer enough to justify a $3.00 rental.